Punctuality is one of the most desirable traits in a person. Being on time is not just impressive, it is essential. Think about how it would be if you never work up on time. This simple act of waking up a little late every day would take a much bigger toll on your day. You would reach school late, you will miss classes, you will have to stay back late to catch up on lessons you missed, and reach home late. It would be even later by the time you complete your homework, and you will go to bed late. As a result, you will wake up late the next day as well, and the cycle will continue. In this article, we will take a closer look at why being on time is important for a healthy functioning. First of all, being on time means never having to miss out on anything. If you wake up early and get ready on schedule, you will never miss a bus, train, or flight. It is said that stations and airports are places where great journeys begin, and it is true. Missing a particular flight or a train might not seem that big a deal since you can always catch a later one, but you will never know what experiences you might have had on the one you were supposed to be on. Besides, getting a later transport might cause you to miss important meetings that could potentially have changed the course of your life. Efficiency is something that comes automatically by learning to be on time. When you do everything on schedule (provided you chalk out a realistic schedule of course), you will automatically be a lot more efficient in your job. You will never fall back on your schedule since delays and procrastination will not be words in your dictionary. You will never have to create excuses to explain why you could mot finish your job in time, which will mean that you will be a more valued person in your workplace and elsewhere. Your punctuality will automatically make people respect you more. Since you will be known for being on time all the time, people will learn to rely on you with important work. When an important project is being handled by your organization, the bosses will entrust you with completing the work efficiently and meeting the deadline at the same time, because they are sure you are the person who will be able to assume the responsibility. You will also be valued at home and in other areas of your personal life; everyone will know you are not one to fail an appointment or miss a meeting. 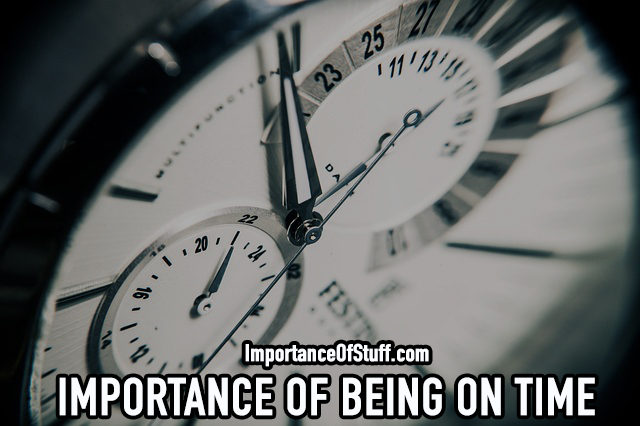 Being punctual also comes with valuing the time of others. Since you know that your time is important to you, you will feel the same way about the time others have on their hands. You will not be one to waste anyone’s valuable time by indulging in meaningless gossip or idle chatter. You will not pressurize anyone to spend time with you when they clearly have something more important to do. This, in turn, will make you a lot more endearing and reliable person, someone others will want to hang out with. When you are punctual, you are productive. You know how important time is, which means you also know that lost time can never be recovered. This knowledge and understanding propels you to not waste a single minute of your day. You try to make every moment count, and so you are always engaged in something productive. You are always on the go, trying to learn something new or undertaking a new venture. You are constantly improving yourself, so that makes you top guy in your organization. However, it is not just in your professional life that your punctuality shows. You know that there is a time for everything, and you never fail in your personal life as well. You take well deserved breaks for the rat race when you feel the time has come, and you are always there on time when your family and friends need you. You are not likely to make commitments you cannot keep because your time will not permit, and your friends know that you are not the type of person who will show up late to a party citing excuse of being caught in work. You will always be on time to your child’s recital at school or our spouse’s first exhibition. In short, your punctuality helps you maintain the perfect balance at home and outside. Punctuality is important in all aspects of life. By being on time, you do not let the clock dictate you, but you decide your own time for everything. Scheduling is important to maintain time; as long as you have made a realistic schedule that you can certainly meet, feel free to push yourself to meet the deadlines.